For Immediate Release: Posted On 7/15/2010 By Industrial Magnetics, Inc.
Industrial Magnetics, Inc. has published a new, 28 page, full color catalog titled "Magnets for Material Handling" which includes over 30 new magnetic products and tools for increasing the speed, efficiency & safety of material handling operations involving metal. Highlights in the new catalog include an expanded "Lift Magnet" section featuring the new BasicLift™ and VersaLift™ magnets, an "Inspection Mirror" section, which includes a mirror used for under vehicle inspections, and a "Welding Magnet" section which features the new "Mag-Pry" for leveling two steel surfaces prying to welding. Also worth noting in the "Hand & Pocket Tools" section are the 12 magnetic tools that now carry a National Stock Number. 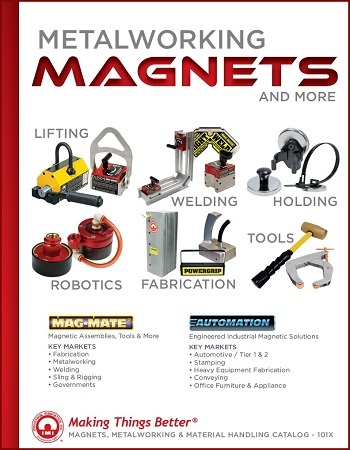 The "Magnets for Material Handling" catalog can be obtained by downloading from the company’s website (login required) at our media center or by requesting a hard-copy by emailing imi@magnetics.com.